We’ve spent the past three days in Memphis, extended longer than our usual book tour duty because we visited at length with patients and staff at Le Bonheur Hospital. We took a hard hat tour of their new facility, in addition to what I can only describe as an inspirational (and heartbreaking) tour of their current facility, as well as a special afternoon of art therapy with patients of all ages. The new hospital is impressive to say the least, and they walked us through with hopes of securing some Rodrigue artwork for their public spaces. George would love to be a part of this hospital --- a place that accepts all children as patients, regardless of their family’s ability to pay --- and so we are hoping to get the details worked out and have some Blue Dogs (probably some huge reflective works on chrome) installed for their opening in June 2010. We met their physicians, their nurses, their cleaning staff, and administrators, plus the new building’s art committee and foundation leaders and many more. From everyone we understood not only their devotion to their work, but also a compassion for the children in their care. We would be proud to be part of such a group…. ….which is why George spent the afternoon with a group of patients in art therapy, drawing and painting and reading stories and cutting up. If you haven’t visited a children’s hospital lately, do so. It emits a vibration, a feeling of panic, of desperation, of love, of an absolutely clear sense of priorities, of focus, of every raw emotion possible from staff and families and patients. It’s a sad and yet beautiful place, and George and I, without children of our own (his boys are grown now), feel an attachment to these children’s hospitals. We see how his work excites and inspires children. But for George, the connection goes deeper. Le Bonheur was founded in the early 1950s by a group of Memphis ladies who were desperate to combat the polio outbreak. 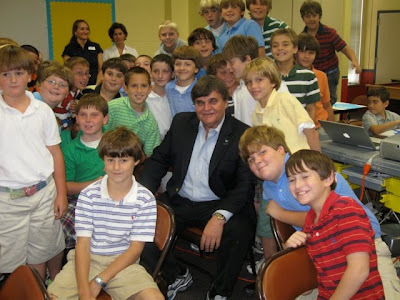 And in 1953 George Rodrigue was diagnosed with polio. He was bed-ridden for three months, unable to walk. He was contagious, so he couldn’t play with his friends. His family didn’t own a TV set. And he was an only child, bored and scared at nine years old. It was during this time that his mother bought him a paint-by-number set to help pass the time. George had never painted before, but he knew what to do right away. He turned the numbered canvas over and painted on the backside. He painted fire trucks and alligators and guns and monsters and all of the things that he loved and found interesting as a young kid in New Iberia, Louisiana (he paints in the same way today), and he made up his mind that he would be an artist (no different than if he’d said, “I’m going to be President of the United States,” as far as his parents were concerned). For more on George's early years, see the post "How Baby George Became an Artist." 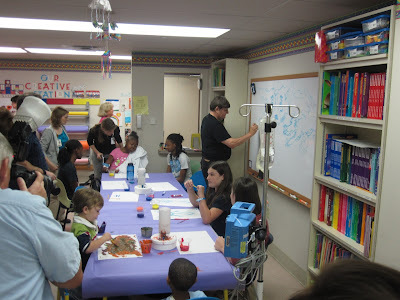 Today he tells this story in children’s hospitals, such as the one we visited this week in Memphis. George relates to the children. He remembers being terrified as a child when he saw rows of kids in iron lungs, thinking he was next. He remembers it like it was yesterday, and he believes in a more positive, nurturing, even inspiring and educational environment for these hospitals, so that it’s not the trauma the kids remember, but rather something positive --- the people they met there, or perhaps the projects they created, the music they heard, or maybe even the time they saw their reflection in the chrome Blue Dog hanging on the wall. George had a great time, and I believe the children did as well. I can testify that they were mesmerized, and if their teacher Darla allows, I’ll post their finished Rodrigue here, as soon as it’s ready. As if the hospital and the school were not enough, we couldn’t visit Memphis without another book signing at one of our favorite independent bookstores, Davis-Kidd. We followed that with a tour of the Belz collection of Chinese and Judaic Art, which I can’t recommend highly enough, if for no other reason than to see the Chinese Blue Dog! 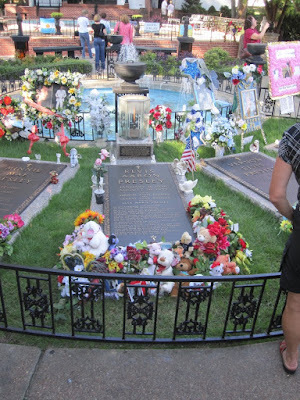 We wound down our experience with “A Little Less Conversation” at Graceland, where I choked once again (first time, eight years ago) over the plastic flowers at Elvis’s grave, and the fact that the fence was so close that anyone hanging over it with a popsicle would drip right on that sacred ground. 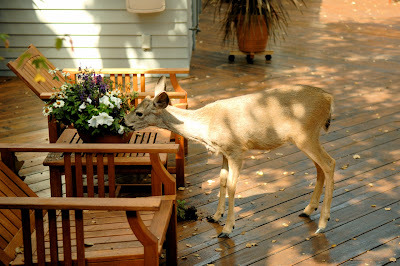 (Oh if they would only let me in there to plant some rose bushes). It will be no surprise to our closest friends that, once again, George and I are in our element visiting America. Just when we think it’s the West we crave, we fall in love all over again with the deep South. (Although I’d be lying if I said I can’t wait to see New York again in a few weeks). And if you’re one of those people who just doesn’t like the South or bar-b-que or Elvis, well .... what's the matter with you, Honey? To be honest, we wondered if anyone would show up at the tiny independent children’s bookstore Hicklebees in the community of Willow Glen in San Jose, California. 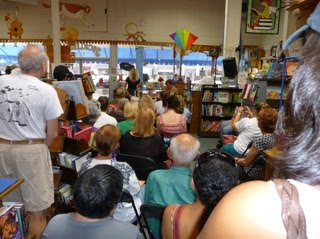 We’d never visited the store before, and it had been years since we’d had a book event on the West Coast. So imagine our surprise when we walked into a full house, complete with a few family dogs and Blue Dog tattoos and long time Carmel gallery clients and a few Louisiana natives (thankfully able to update George with the LSU score) and a ‘Rodrigue’ descended from George’s same Portugese ancestry, and husbands who dragged wives and children who dragged parents and an endless supply of smiling, attentive faces. And what a bookstore! It’s a real endangered phenomena--- the sort of “You’ve Got Mail” neighborhood charm where they ‘make the books come alive’ and serve homemade cookies. 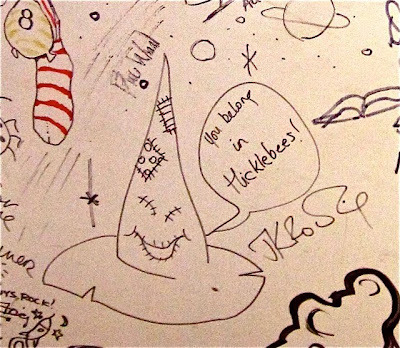 Their walls and upper shelves are cluttered with treasures donated by visiting authors, and the Smithsonian curators must dream about something as special as Hicklebees’ stockroom and bathroom doors, covered in drawings and signatures from famous authors, including a special rendition from J.K. Rowling herself, who signed at the store so long ago that, according to the owner, they had to “beg ten people to show up.” (Harry Potter illustrator, Mary GrandPre', also visited the store several years later and added her Harry and Dumbledore to a door). 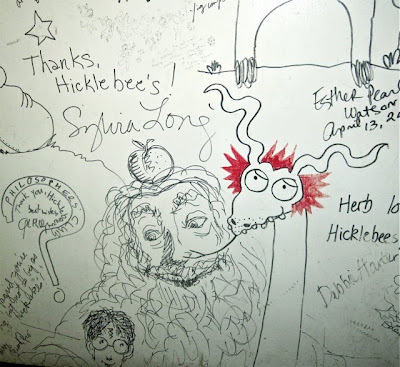 George visited with the crowd (and drew on the bathroom wall), and a group of wonderful young helpers joined me in reading Why is Blue Dog Blue? and Are You Blue Dog’s Friend? We could not have hoped for a better way to launch this fall’s tour. As if that (and the winning Tigers and the great margaritas at the local cantina) wasn’t enough, we had en evening last night that, although unrelated to painting and the Blue Dog, was one in a million and is worth sharing here. 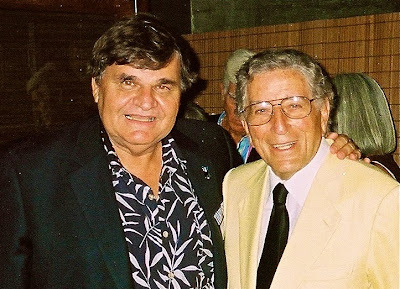 We visited Mountain Winery and enjoyed a concert by the last of the great crooners, Tony Bennett. And boy is he GREAT. 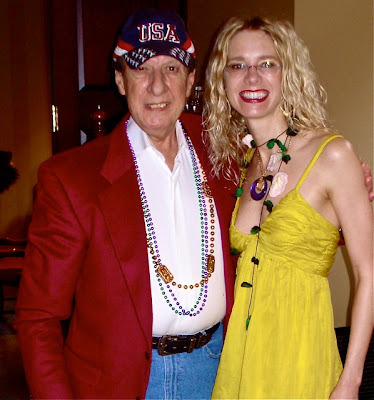 Although we had never met Mr. Bennett before, we have a mutual friend, Joe Segreto (pictured with me below on Mardi Gras Day), who has the Italian restaurant Eleven 79 in New Orleans. Frequented mostly by locals, Eleven 79 gets its name from its address, 1179 Annunciation, and is located just under the on-ramp to the Mississippi River Bridge. On any given night, the place is full of real characters, which I guess includes us (or at least George), since we stop in often just to hear the latest stories and politics from the colorful group at the bar. And sure enough, all that’s left now is one table and a few chairs, all chained together and sitting empty, except for the occasional smoker. The characters, thank goodness, moved back to the bar. What a compliment! Especially after the performance we’d just heard. At eighty-two years old, Tony Bennett sings his classic songs as though he’s thirty-five and, what’s more, as though he’d waited years to be able to share his favorite songs with his fans. There was no hint of boredom or old age. There was a real love of performing, and he danced and sang and smiled with joy at what he’s able to do. It was as if there was no place in the entire world that could make him happier than being right there and doing just that. At one point I even thought to myself that he seemed surprised and humbled that we all showed up. One of the coolest things about a healthy old person is that they remember everything that ever happened to them. They lose their shyness and their concern for what people think. They live for living. The old Italian men often fall into this category (at least the ones I’ve met), although I’m reminded of this story George tells about former Louisiana Governor Jimmie Davis (not Italian), when at nearly one hundred years old, he shuffled onto the stage, introduced his band, and stood straight and tall as he danced a jig and sang his mega-hit, “You are My Sunshine,” while the audience went crazy. Between songs, as we stood and clapped our hands raw, George laughed and laughed, not because it was funny, but because he was so happy. I’ve only heard that reaction from George one time before, which is why I recognized it. Don’t get me wrong, George laughs all of the time at funny stories, Cajun jokes, and well, at me (as I was just reminded, when he looked over my shoulder as I write this, laughing, “Man you talk a lot,” followed by more laughter at my expense as he recounts his recent gin rummy victory.) But laughing at the concert was different, and I recognized it immediately as the same hearty laughter I heard at a Three Tenors evening in Las Vegas many years ago (and no doubt the same laughter from that Jimmie Davis performance), when three aging Italian men gestured with great exaggeration to their audience ----with gratitude for our applause (Carreras, with hands over his heart), an out-pouring of love (Domingo, with arms outstretched), and the confidence of his own magnificent performance (Pavarotti, reaching to the sky). George was lost in joy, unable (and unwilling) to control his laughter. And last night, as he laughed the same way, I cried, over the beauty of the music, the beauty of this talented performer, and the beauty of my happy, happy husband. I cried so much that a false eyelash crawled down my face like a spider, so that when I turned to look at George, he laughed even harder. And as this stylish, gracious, Italian man sang (about his hometown of Astoria), “Just a little street where old friends meet …..and treat you in the same old way, ” I thought about New Orleans and the characters at Eleven 79 and the psychics at the Bottom of the Cup and the waiters at Galatoire’s and the school children at the New Orleans Museum of Art and the guy who traps our rats, and the workers at the new gallery on Royal Street, and the ghost tour guides, and the artists on the fence, and our landlords Norbert and Myra, and even the cranky neighbor who keeps shutting down our construction because she can’t get any sleep before heading to her night job, and I felt touched by it all. There’s nothing like a hometown (however you define it), and we could not have been more beautifully reminded of New Orleans, ironically, than by our afternoon in San Jose at Hicklebee’s Children’s Bookstore and our evening with Tony Bennett, under the stars at a California winery. 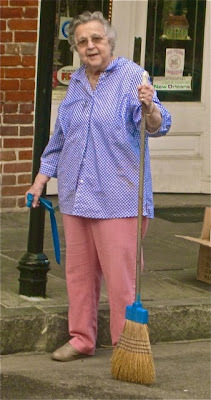 I'll end with a photo of Myra Landry, an ex-nun who has called me “Winnie” for so long that I’ve come to like it (from her, that is) and who, along with her brother Norbert, has been our landlord at 721 Royal Street for the past twenty years. We’re in Carmel, California for a few days before heading to San Jose to begin the book tour. 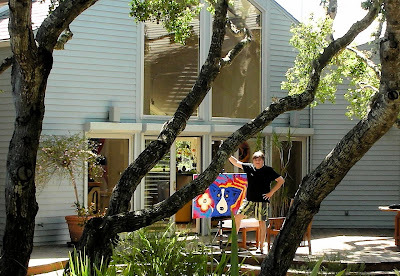 George Rodrigue has had a gallery in downtown Carmel-by-the-Sea since 1991, and we purchased a home here in Carmel Valley in 2000. 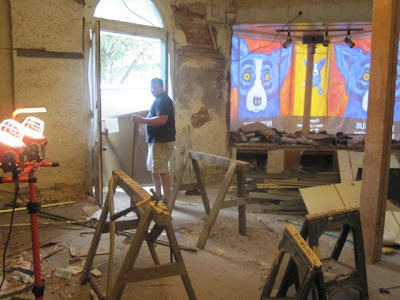 Rodrigue built a studio on the property soon after. I’ve been waiting around and gently hinting all week for him to spend some time at his easel, thinking I would watch him work and take some photos and share the whole thing with you. But alas, he’s just not into painting this week. As I mentioned, we’re only here a few days, and I’m sure that’s the reason for his lack of inspiration, not that he hasn’t been inspired to do other things – like email plans and ideas to the architect at the new Royal Street gallery, and work on framing and installation strategies for his upcoming project at the WW II Museum, and take pictures of the wildlife that also live on this hill, quite oblivious to us, since they call this place home far more often than we do. Usually George needs a big block of time (or on occasion, a looming project deadline) in front of him in order to paint. When we spend several months here, he paints anywhere from ten to fifteen hours a day, because it is here in the country on this sunny, quiet hill that he does most of his painting. George has always had an attachment to California. In the mid 1960s he attended art school at the Art Center College of Design in Los Angeles (quite exciting at that time, since it’s when Warhol’s Campbell’s Soup Cans premiered at the Ferris Gallery, to the art professors’ and critics’ horror, and to the art students’ amazement). He took several drives up to Carmel in those years, where he found a (an extreme now long gone) Bohemian type art community, full of artists in residence and people escaping from city life, appreciating the wondrous beauty of this western edge of America, the mountains meeting the ocean, and a tiny town hiding in the fog. He became attached to the place, and he formed a dream to live and work here one day. 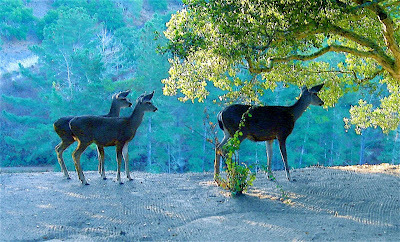 And like most George Rodrigue dreams, he made it happen, first with a gallery, and then with a home ---- not a mansion on the coast, but a hidden spot on a mountain top, with land (eighteen acres) and sunshine (just on the other side of the near-daily Carmel fog bank) and animals --- lots and lots of animals. 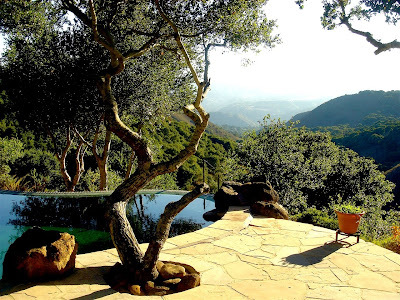 Just yesterday we saw two great horned owls as they sat at the edge of our pond-like pool, watching the sunrise over the valley. Soon afterwards a bobcat arrived to quench its thirst. And this afternoon the daily line-up of thirty or more quail bobbed their heads and squeezed together for a drink (although they had plenty of room to spread out), protecting their little ones in the center --- so cute because they look exactly like the adults, but about three inches tall. I sat paused, waiting for George’s answer. We chose our house because it is in the middle of an oak grove. Unlike the Louisiana Live Oak, these trees grow from their knots after a tree falls. They drip with moss, and their branches, unlike the heavy, weighted-with-history oaks of Louisiana, spread like skinny, graceful fingers towards the sky. 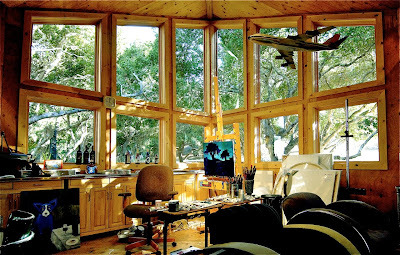 So here in Carmel, where he painted the entire abstract Hurricane series of seventy paintings between 2000 and 2003, and where he often paints outside on the deck, surrounded by mountains and the California oak tree, he paints the designs and shapes swimming in his head. He paints, always, Louisiana. Yet it’s not Louisiana as much as it is his Louisiana – like no one else’s, and also affected by his travels, by the people he’s met, by his curiosity about the stars and fate and déjà vu. 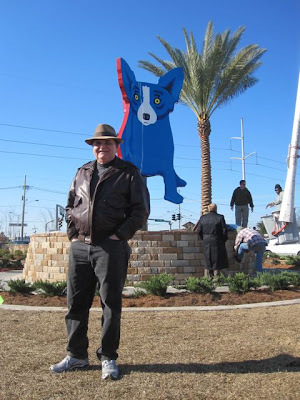 It was probably ten years ago that George Rodrigue started work in earnest on the concept of a Blue Dog sculpture. He dabbled as early as 1992, but those pieces were flat cut-outs made of wood, usually mahogany, about two inches thick, and painted as if they were on canvas. Occasionally he surrounded these pieces with neon or added other elements to the shape, such as a moon or hot dog. He also tried a few on poles, without a front and back, but rather with two fronts -- one side blue and the other side red. From the beginning there was a real challenge in creating the dog as a sculpture, because for George the Blue Dog only exists in two dimensions. It’s not like a dog at all. 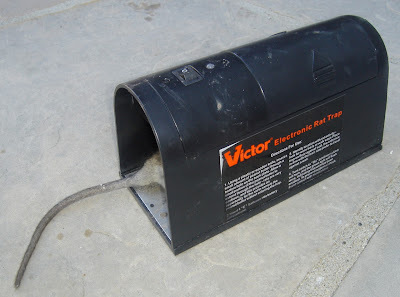 It doesn’t run or bark or chase its tail. It doesn’t have a backside. It only exists in a specific pose and on a flat plain within a Rodrigue painting. These early sculptures were fun; however, other than their wooden structure, they were no different than had he cut the image from a painting with scissors, attaching it to the wall sans background. The idea of a three-dimensional sculpture haunted George, but an effective design eluded him. In addition to wood, he experimented with bronze and plaster, but still the results were cut-out shapes that hung like canvases. 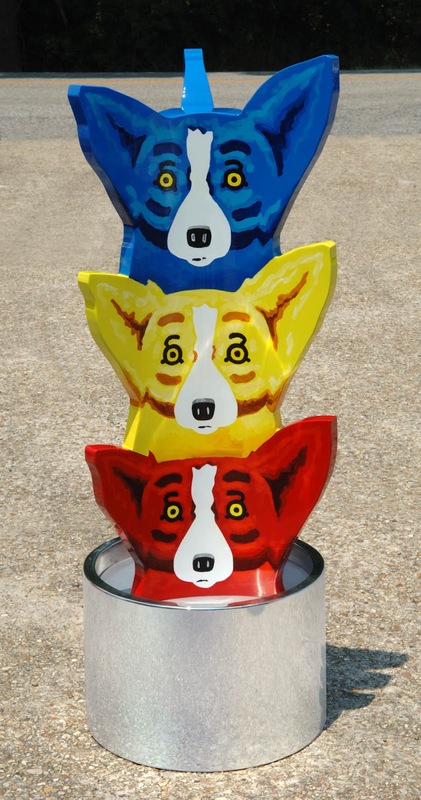 Rodrigue was in search of a sculpture that would stand on its own while retaining the strong, well-defined Blue Dog shape. 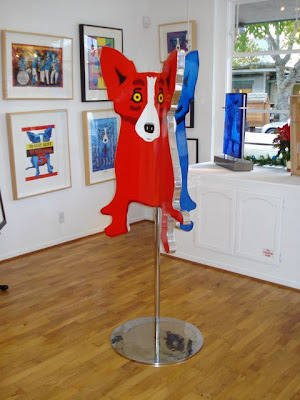 By the late 1990s, the idea of a Blue Dog sculpture became almost a daily part of George’s creative process. He played with paper and cardboard, bending and pasting and cropping, with occasional add-ons such as toothpicks and mini-easels, in hopes of creating a model that was more than just a shape cut from a painting. 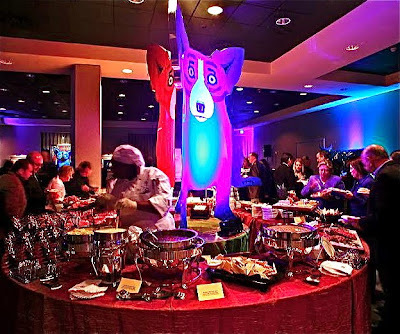 And that was how three cocktail napkins, each balanced on one edge and held together in concave arches between our pinching fingers, became the design for the Blue Dog Sculpture. Each side would be a dog-front, with the feet matching up at the bottom. 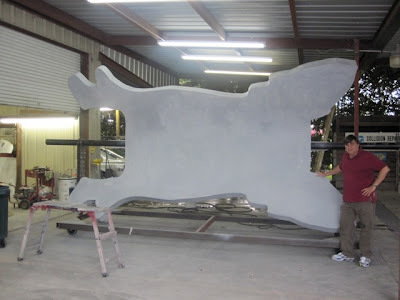 George went on to explain over dinner that the three-sided piece will be two hundred and fifty feet tall, hold a Louisiana Welcome Center and Historical Museum at its base, and sit on a grassy area at the foot of the Luling Bridge, just outside of New Orleans. The following week he visited Begneaud’s Manufacturing in Lafayette, Louisiana and began work on a four-foot prototype constructed of chrome, aluminum, and steel. 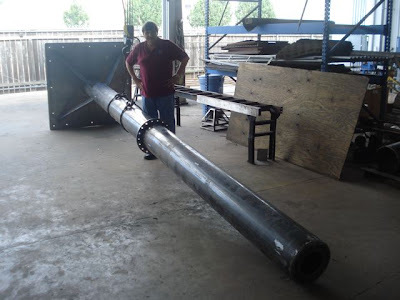 There were many challenges during this trial run --- most importantly, how to bend the metal, avoid problems with wind (for the big one, that is), theft (for the small one, that is), and birds (it’s an attractive perch at any size) and how best to apply the color. 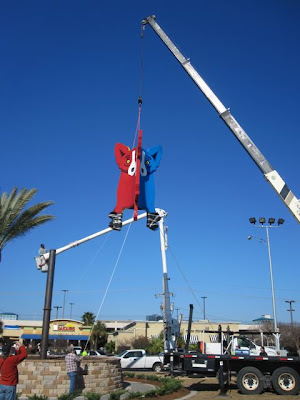 In the end he mounted the piece on a heavy stand and pole, elevating it three feet off the ground, completing the job at an automotive paint shop where he sealed it like a car. Within a month of his ‘eureka’ with the cocktail napkins, George finished a four-foot version and saw endless possibilities for integrating the piece as public art. Within six months he created an eight-foot version, also red, yellow, and blue, now installed at the Sculpture Garden at the New Orleans Museum of Art (given by George in memory of my mother, Mignon Wolfe, who loved to walk there). 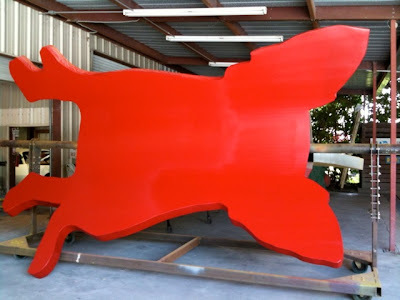 Today he works on his most exciting version yet: a 28-foot sculpture to be installed January 2010 on Veterans Boulevard in Metairie, Louisiana (a suburb of New Orleans). 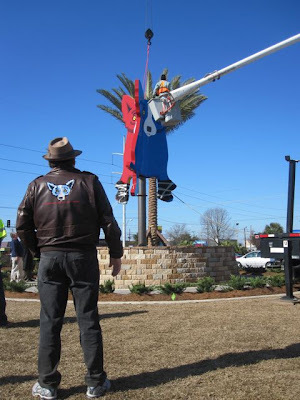 This large scale prompted new challenges, including working with and curving enormous sheets of metal, transporting the work from the fabrication shop more than one hundred miles, arranging landscaping, security, lighting, and parking, planning for hurricane force winds, and most importantly, working with area legislators and citizens to ensure a sculpture and installation that adds in a positive way to their community. Nearly a year in the making, this impressive piece is almost finished. The landscaping is underway, and the pole will be installed this Wednesday. 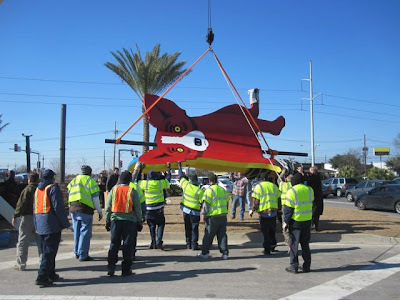 Last week it received its automotive flat colors of red, blue, and yellow, and in early October Rodrigue will paint the details, as the sculpture, suspended and lying on its side, turns on the giant rotisserie he designed for this purpose. 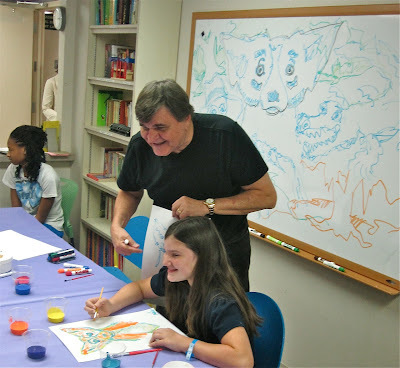 In usual George Rodrigue form, these current projects are just the beginning. In the past month, he designed a table for the new gallery space (base plans pictured below), and he’s playing with a three-dimensional wall piece by dissecting a giant sculpture. 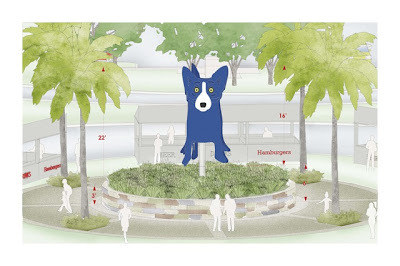 And what of the two hundred and fifty foot gateway Blue Dog? Oh he’s still talking about it. Nothing would surprise me. And he would respond with a drawing of a house, exact down to every window and cornice, and then mix his paints until he got the right color. One night, not long after we were married, I awoke long after midnight and found him on the floor of the bedroom with a flashlight, designing a new car. He said he couldn’t sleep until he got the plans down on paper. That’s George. He sees things in a different way --- at least in a different way from me. It wasn’t until his exhibition in the spring of 2008 at the New Orleans Museum of Art that I started grasping what was going on. I took hundreds, possibly thousands, of kids through that show, and there were two major consistencies --- the younger children (say age 5-7) got everything; the older children (say age 15-17) got almost nothing, and could have cared less. I realized then and there that ‘seeing’ is a precious gift, and even more importantly, that it is something we all have early on. Unfortunately, most of us lose it. So do I think it takes a six-year-old to appreciate a Rodrigue? Well, time has told us that the fan club is far wider in age range, so fortunately the answer is 'no.' But I still think there's something to be gained by seeing art --- any art--- and more importantly, seeing life, through the eyes of an untainted, focused, mindful child. Without prejudices, life becomes something new. As children, we don't have the prejudices, but as adults, we have to turn them off. Not easy at all, and for some maybe even impossible. Yet George taught me to see again ---- not as well as these children --- but nearly as well as perhaps I did in my own early years. My Rodrigue-seeing education started with the Monet paintings at the Orangerie in Paris nearly twenty years ago, but I’m going to save that exact story for late next month when we’re in New York and viewing MOMA’s Monet murals, on view in their entirety for the first time in many years. The older students on the NOMA tours ranged from feigned interest in the subject of a painting, to curiosity about the dollar value for a Blue Dog, to rolling eyes (which I attributed to George’s ‘old-fashioned’ technique of paint-on-canvas, as opposed to the contemporary rage of installation, conceptual, and video), to sheer boredom (which I attributed to teenage angst…. No explanation necessary, I hope). It’s very difficult in art, and even more so in life. But there's a lot to be said for personal expression, and if you look at something and you just don’t get it, step back and imagine yourself six years old…..and look as if for the first time. Better yet, bring a six year-old with you and ask them what they think. You might be surprised by what you see, and by what you learn. After vowing several years ago that we would never tour again, it seems that, sort of like Mardi Gras float rides and over-the-top Christmas decorations and childbirth (or so they tell me), somehow the subject of a tour comes up nearly every summer, and before we know it we’ve got 15 cities on the roster. We've scaled back quite a bit (the late 1990s meant anywhere from 25-50 cities in a two month period), but autumn still means we’re hitting the road, especially with the release of a new book. In the old days, we might see 800 people in one location (thus the rock star reference). It was insane and wonderful and exhausting, and inevitably at some point we worried that we had let people down, because maybe we didn’t smile as much on stop 34 as we did on 33, and maybe the woman who spray-painted her dog blue seemed more cruel than cute now, and maybe the unfairness of the question, “Will you sign my Jazz Fest poster?” – the one you paid less than half as much for unsigned as others paid for signed – just tipped the end of my patience scale and caused me to snap at a genuine Rodrigue fan who was only asking a hopeful question, not knowing they were the fiftieth one to ask that week (my sincere apologies if you’ve been on the other end of my occasional attitude at some stop over the years). It’s not that we don’t enjoy seeing everyone on the road. It’s just that, like all things in life, this too has changed, and the early book tour days of major press and huge crowds and class visits have been replaced by internet e-mailers, advance orders, and e-bay retailers. There was a time when George could sign anything a fan brought him, but those days are over, since most of those sorts of items are forgeries or derivative works, and we cannot risk their showing up on e-bay and, worse, some unsuspecting fan paying hundreds of dollars for a page cut from a book. 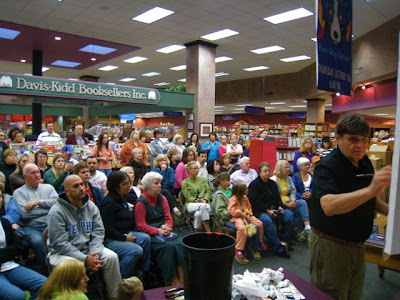 Even large stacks of books have to be dedicated, lest an on-line retailer charge inflated prices for signed copies, when in fact George is happy to sign his books for free at any scheduled event. 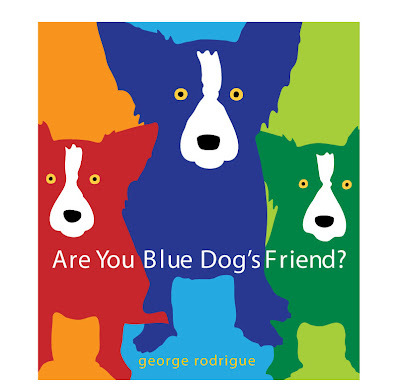 This year’s short tour focuses on George Rodrigue’s second children’s book, Are You Blue Dog’s Friend? (published by Abrams Books for Young Readers, October 2009). 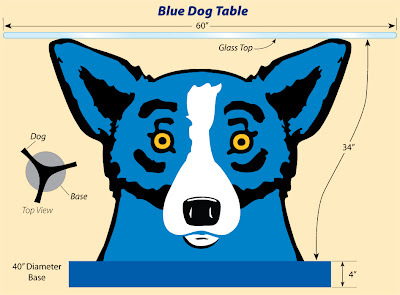 The book is a follow-up to the wildly successful Why is Blue Dog Blue?, (2002) which encouraged children to use their mood and imagination to paint however they want, as opposed to painting things as they really are. The new book features the same fun call-and-response rhythm, but also includes many classic Blue Dog paintings, some with animals such as monkeys and cats, and others with celebrities like Louis Armstrong and Elvis. A children’s book tour is unique, because it gives us a chance to read these short texts in their entirety and involve the kids. This is our first in several years. Last year we toured for Blue Dog Speaks, a small but very thick picture book featuring more than 300 paintings (Sterling Press, 2008). As with this year much of that tour was by car. 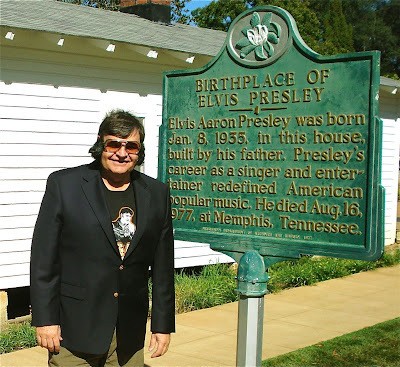 The driving tours are our favorites, because we have more freedom to explore, such as our detour through Tupelo, Mississippi last October, which took us to the birthplace of George’s favorite rock & roll star. This year is probably half as many stops, but we’ll still have some adventures, and I’ll keep this blog updated with stories from the road (including some special visits we have planned for children’s hospitals in Memphis and Austin). 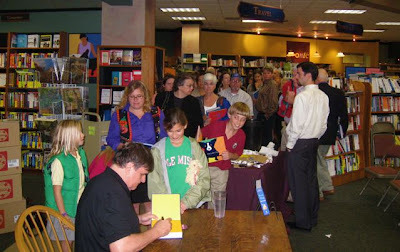 For a complete list of cities, dates, and bookstores, visit http://www.georgerodrigue.com/rodrigue/books.htm where we’ll post the tour by the end of this week. First stop: San Jose, California on Saturday, September 26th. 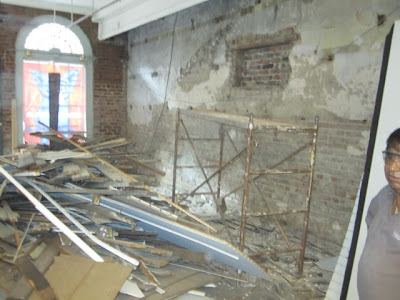 As you may have heard, we are moving the New Orleans gallery in the spring. After twenty years renting in the same location at 721 Royal, we’ve purchased a building just across the street at 730 Royal, adjacent to St. Louis Cathedral and over-looking St. Anthony’s Gardens. The French Quarter is full of rich history, and this property is no exception. Built by the Catholic Church in the 1830s, its bottom floor has been a retail space and its upper three floors apartments from the beginning. 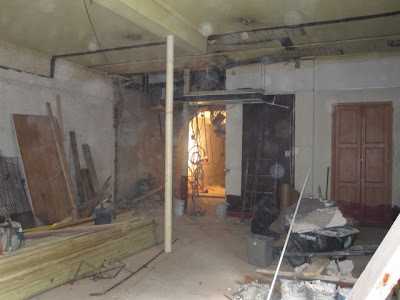 Half of our new gallery space was for many years the Bottom of the Cup Tea Room (now located at 327 Chartres). Established in 1929, this legendary institution employed (and still does) some of the city’s most famous psychics. Surely they left behind some mysterious and elevated energy resonating between the old brick walls. The building is also a stop on the nightly New Orleans ghost tours. Some 150 years ago a young woman named Julie, mistress to an Uptown businessman, wanted desperately to marry her lover. Tired of her pleading, he challenged her to stand naked overnight on the roof of the French Quarter apartment building where he supported her. Never thinking she would accept this bizarre proposal (made during the revelry of a ball), he was surprised to find her the following cold winter’s day on the roof --- naked, frozen to death, and still clinging to the chimney. It is said that one can see her ghost even now wandering the roof and hear her sadness as she cries for her lover. 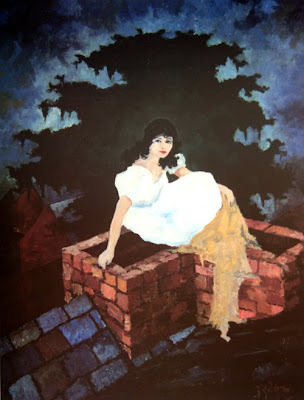 Created in the mid 1980’s A Night Alone is George Rodrigue’s rendering of this famous ghost story, and for many locals this painting has come to represent Julie’s image (in the same way that Rodrigue ‘invented’ the image of Jolie Blonde). 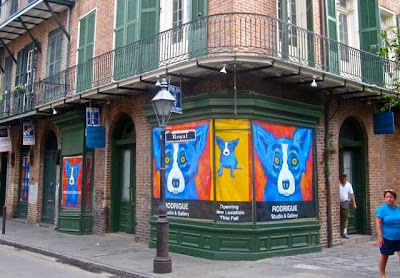 Now his gallery will be housed in this same building --- the setting for the only painting Rodrigue ever created of the French Quarter. Just as interesting, although not quite as mysterious, is the story of Larry Borenstein, an immigrant from the Ukraine who lived for nearly thirty years at 730 Royal, beginning in the early 1950s. 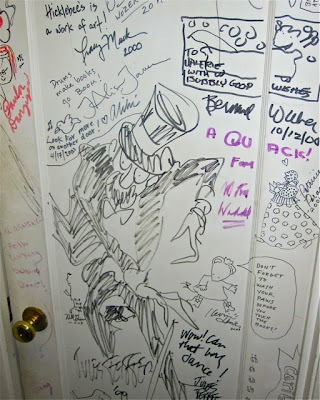 He had a small art gallery downstairs, but his main gallery was at 726 St. Peter’s Street, adjacent to Pat O’Brien’s. A lover of jazz, Borenstein invited musicians to play in his gallery in the evenings, a tradition that lasted more than ten years. Those sessions became so popular that they eventually overtook ‘Mr. 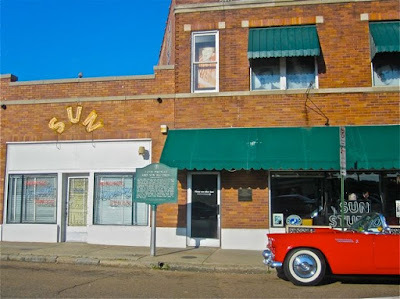 Larry’s Art Gallery,’ and became instead the legendary ‘Preservation Hall,’ which it remains today. 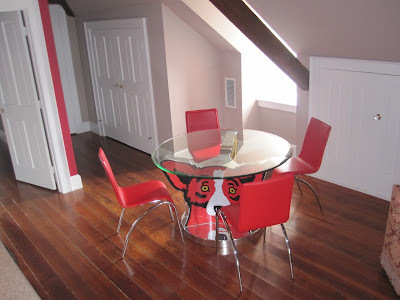 “His house behind the Cathedral is really a study in strangeness. It’s a beautiful house, a valuable piece of property. I went over to visit Larry. Larry wasn’t there. It was boiling hot. In the room I was in, there were two chairs and a kingsized bed with no bedclothes on it, and a light bulb hanging from the ceiling. Windows all closed, stuffy as anything. I’m sitting close to Sascha, Larry’s daughter, having a conversation, and it struck me that this would be a great scene in a movie. Paint was falling off of everything.” From the 1999 book Preservation Hall: Music from the Heart by William Carter. 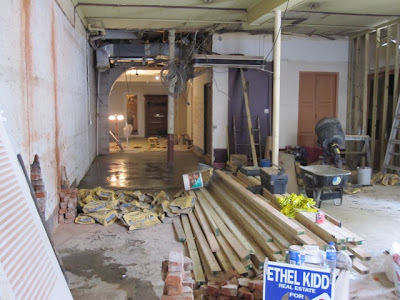 From that description, you should not be surprised by our latest construction photos below. I’ll keep you updated as I learn more about this wonderful space and as both the property and Rodrigue begin a new chapter in their respective histories. Written after reading a recent article about a ‘discovered’ (by x-ray) N.C. Wyeth painting located underneath a later N.C. Wyeth painting (turns out he had re-used the canvas). The resulting on-line debate and discussion covered everything from illustration vs art, to the artist’s intention in covering or ‘hiding’ an earlier work, to the definition of ‘artist’ itself. 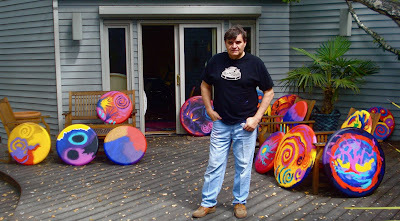 My husband is an artist and at 65 years old has supported his family and made a good living that way his entire adult life. He did it on his own after galleries rejected him and arts organizations snubbed him throughout Lafayette and New Orleans. 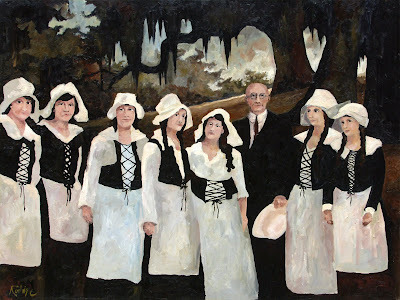 Ironically, he was painting Louisiana Landscapes and Cajuns at the time, but the local art establishment found his work crude and local collectors (with the exception of a few forward-thinking individuals) thought his depictions of the Cajuns (his people) insulting, and his work was dismissed with disdain. 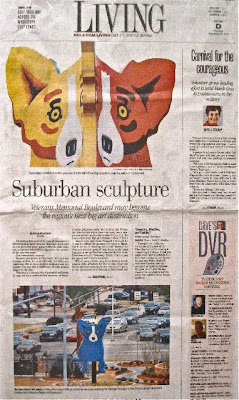 (His first newspaper review was titled, “Artist Paints Dreary, Monotonous Oaks” ….and it got worse from there). He sold these paintings of Cajuns and Louisiana with much success, however, on the road (literally from the trunk of his car), far from Acadiana, in cities like Houston, Atlanta, Los Angeles, and Miami, and this taught him something very valuable ---- that it wasn’t so much what he painted, but rather how he painted that drew others to his work. This success, however, was not without its painted casualties. 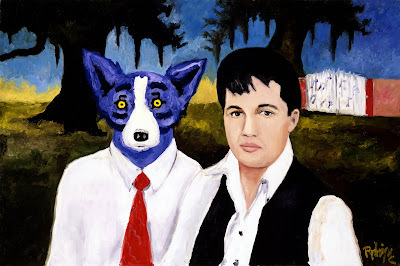 We’ve been together nearly twenty years, and I’ve seen George Rodrigue (as recently as this summer) reject numerous paintings, relegating them to the garage or the back of a closet. Interestingly enough, he rarely paints over them. It’s funny, he often tells a story about when he first started painting landscapes some 45 years ago, and how he would sometimes have 20 paintings underneath the final work. One day he realized that he couldn’t see his development. So he forced himself to ‘finish’ each work (sometimes literally starting at the top of the canvas and then just working his way down, filling the white spaces) and switch from canvas to canvas until he got what he wanted (what he wanted at that moment, that is, because the next day he ‘wanted’ something else). In working this way, he was able to look around his studio and see what he’d done, and as a result he learned from his mistakes and moved forward. 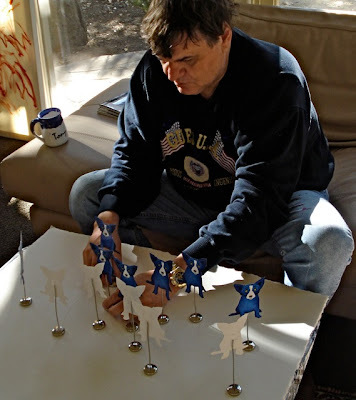 And so here he is today painting the Blue Dog (as criticized as his Cajuns in the beginning) and Landscapes and Figurative works and exploring new mediums like chrome and aluminum, and still learning and growing and solving puzzles in the same way. I have heard George say many times that the thing he enjoys the most is the actual process of applying paint to canvas. He doesn’t listen to what anyone says (and never has) with regards to his art, but rather continues in his own direction, constantly exploring and changing and never, never looking back. Does it bother George to know that the works he rejected will probably one day end up on auction blocks or hanging in collections? I don’t think he gives it a second thought. Actually, I think that if it were possible, George would fill our closets with nearly every canvas he’s ever created, because his favorite, his best painting, is the one he’s working on right now. The others just don’t measure up. Are these the actions of a true artist? I think some would say so. George attended art school to become a graphic designer. Does that diminish the quality of his forty plus years of accomplishments on canvas? I’ve asked him before about an illustrator vs an artist. He replied that Norman Rockwell* was an illustrator in the truest sense, but that N.C. Wyeth was an illustrator whose work became something else --- something closer to ‘fine art.’ I don’t think he meant to describe either one in a negative way (we were standing in a Rockwell exhibition at that time and enjoying the visual experience immensely); he merely stated the facts as he saw them from his unique vantage point. And as to George himself, in all the years we’ve been together I’m surprised at how rarely I hear him refer to himself as an artist. In interviews, questionnaires, and general conversation, his standard reply regarding his occupation: Painter. And as to me (a student of art history, an amateur collector, an avid museum-goer) I’m more of a romantic (possibly better described as a romantic sap). 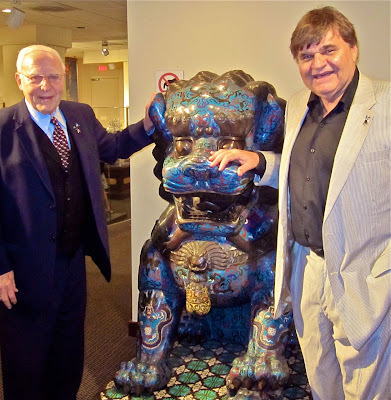 In the first three years I worked at Rodrigue Gallery, I barely spoke to George. He was Picasso in my eyes (still is, of course, and more), and the admiration and awe made me feel unworthy and frankly, star struck (the same thing happened on a particularly embarrassing day at the Louisiana Book Fair several years ago when I attempted and failed to get my prized first edition of The Keepers of the House signed by Shirley Ann Grau – but that’s another story; oh! And the time I met Steven Tyler, but now I really digress**). Although of course I like some works more than others, I admire any artist, any creative individual who has the wherewithal to express themselves through music, painting, poetry, photography, illustration, whatever in a sincere manner, and I’m downright grateful when they choose to share it with the rest of us. *For more on Norman Rockwell, see the post "Eagle Scout"
**Both the Steven Tyler and Shirley Ann Grau stories are here. 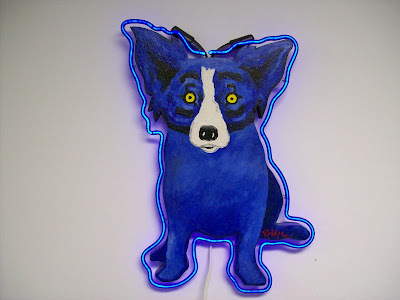 I decided to give blogging about George Rodrigue and his artwork a try, because he is an interesting person, an incredibly creative individual, and there’s something worth writing about (and sharing) going on around here nearly everyday. If you want to purchase or sell artwork, learn an insurance value, get a book signed, inquire about a donation for your non-profit, submit your child’s Blue Dog rendering for our website, learn about the George Rodrigue Foundation of the Arts, request an interview, obtain an education packet, download a screensaver, purchase books, calendars, or notecards, join our mailing list, or basically discuss anything other than questions about the history, style, and subject matter of the art of George Rodrigue, please send your questions to info@georgerodrigue.com. For a brief biography of the artist, a timeline of events, an archive of articles and television appearances, gallery information, and photos of recent works visit www.georgerodrigue.com.